We are super excited to enter a new phase in the growth of become Recruitment as we begin 2019 by expanding our business opportunities into Queensland, Australia. With a new office in Brisbane, we are connecting great candidates with top businesses in the area and showing the state what we can offer as an established and growing creative and digital recruitment agency. In bringing our skills and expertise to this new geographical region, we anticipate great success for the year ahead. So, why did we choose Brisbane? Besides the obvious beautiful weather, the abundance of outdoor activities and Brisbane’s proximity to beaches, rainforests and reefs make it an outstanding place to be! Our particular intrigue with the city comes from its digital creative industries, which have soared in recent years. Further to this, the $60 million creative industry precinct of the city boasts some of the most advanced digital facilities in Australia, and globally. The precinct provides an opportunity for creatives to connect and collaborate with one another fuelling the creative fire burning through Brisbane. 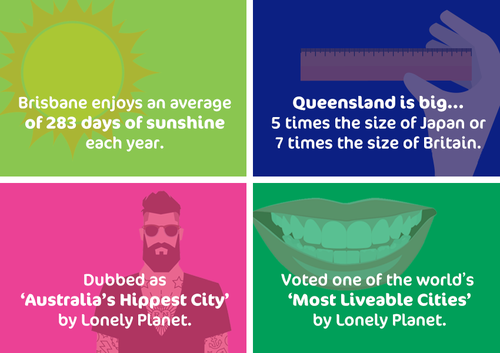 Did you know these fun facts about Brisbane? Register with become to start the journey to your dream job whether that be in Brisbane, Sydney, Melbourne or further afield in the UK or Hong Kong.